As soon as his mom saw the cat, she knew she had to get it for her son. Owasso, Oklahoma - A little boy who was bullied because of the way he looks now has a special friend that makes him feel not so different. Madden Humphries, who's 7 years old, was born with what's known as a bilateral cleft lip and palate. He also has a condition known as heterochromia iridius, which means his eyes are two different colors. It gives Madden a unique look. But some people over the years haven't been as accepting of that distinctiveness. After he was bullied on a schoolbus, he made an anti-bullying video that went viral last year. But since then, his mom, Christina, found a cat that had the same conditions. 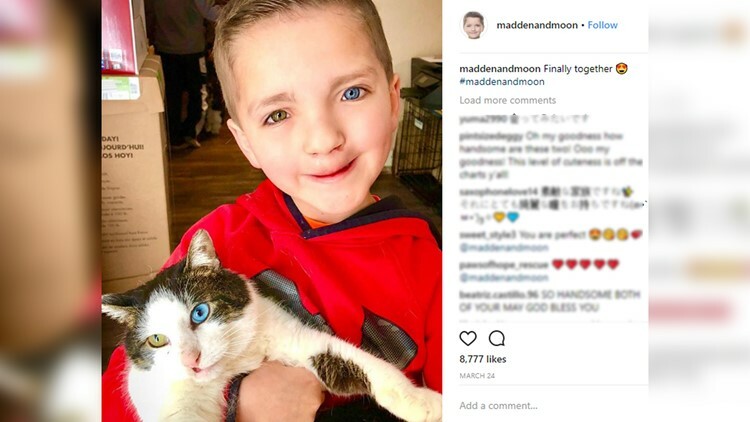 She said she was looking at an online support group for children for cleft lips and saw a picture of the rescue cat, named Moon. She knew she had to get it for her son. There was a bit of trouble: the cat was at a shelter in Minnesota, and the Humphries live in Oklahoma. And the shelter had a policy against letting someone adopt unless they go in person. So with the help of generous donations from friends and family, the Humphries made the 22 hour round trip to pick up Moon. She said once they got there, the cat immediately responded to her son.